Be ready to raise your right hand. Everyone who joins an arm of the United States armed forces has one thing in common. Each person must be sworn in by repeating the officer’s Oath, which every service member must adhere to for his/her entire military career. Military members who take the Oath are defending the Constitution of the United States, and not one particular person. The child, whose dream SPC Harris is trying to protect, is 7-year-old Xzayvier Buchard-Mease. In September, SPC Harris was doing some community work in a west-side Grand Rapids neighborhood, spending time in single-family homes and talking to kids, when he ran into Xzayvier and his parents on a sidewalk. “I was wearing my Army uniform, and I remember how awestruck Xzayvier was, and how much he said he wanted to one day become a soldier,” said SPC Harris. “Xzayvier asked me to wait outside, while he went into his house and brought out a ‘Build-a-Bear’ [stuffed animal bear] that was wearing an Army camouflage outfit, very similar to the one I was wearing at that moment. 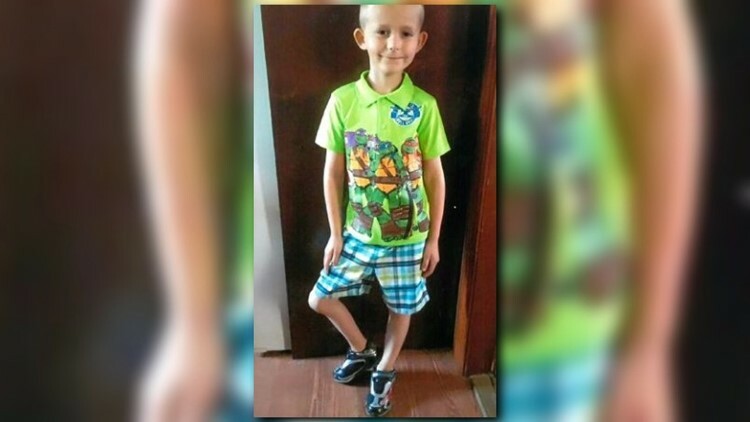 Xzayvier Buchard-Mease was diagnosed with a rare leg disease when he was 4 years old. It&rsquo;s called &quot;Flexion Contracture,&quot; and it causes the leg to not bend properly. Xzayvier has gone through five surgeries, but none have helped. Xzayvier’s parents, Christine Buchard and Andrew Mease, began telling SPC Harris about the physical handicap that has crippled their son since birth. “Xzayvier has a rare knee deformity called ‘Flexion Contracture,’” said Christine, Xzayvier’s mother. “Basically, his right leg has remained bent at the knee since he was born. Christine says Xzayvier’s leg started hurting him when he was 2 years old. By the time he turned 5, the family had received the diagnosis, and the only treatment plan was for Xzayvier to undergo several surgeries. He’s had a total of five surgeries since his diagnosis, but none of them have worked in helping straighten his right leg. Surgeons broke his femur bone twice during two of his surgical procedures. Christine says the most recent surgery made Xzayvier’s leg worse. Amputation isn’t a reality most 7-year olds have to face, but this is the case for Xzayvier. Learning Xzayvier’s heart-wrenching backstory, after hearing him express his deep desire to become a soldier, got SPC Harris wondering if there was anything he could do for him. I viewed it from a military point of view,” said SPC Harris. “We have veterans that have been in war combat, and really need our help. “This young man came up to me, and expressed his hopes and dreams. I decided that with all my power, I was going to help him. SPC Harris began coordinating a day that Xzayvier and his family would never forget. 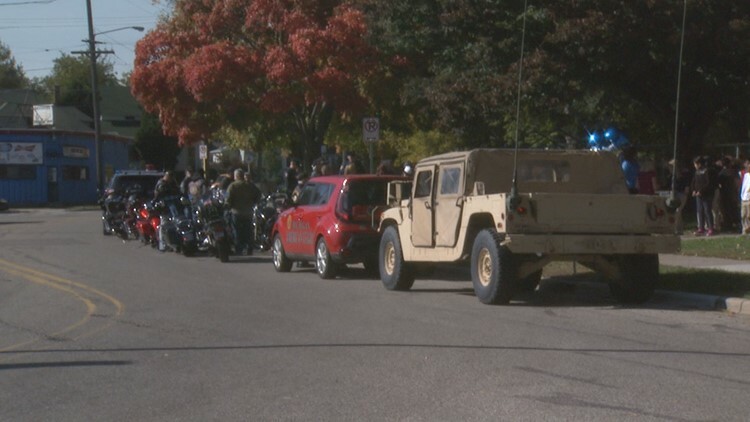 The event involved commitments and contributions from the United States Army Reserves, Michigan State Police, Walker City Police and several Grand Rapids city officials and dignitaries. Harris began planning the event in late September. He kept Xzayvier’s parents looped in to every detail, but wanted to make sure Xzayvier knew nothing so the day would remain a complete surprise to him. SPC Larry Harris was escorted by Stocking Elementary staff to Xzayvier’s classroom. Harris walked in and stunned the boy. This was the moment Xzayvier’s day-long surprise began. On Friday, Oct. 14, several law enforcement vehicles and Army Humvees departed from the Army Reserve Center in Walker. The string of vehicles was making the short trip to Stocking Elementary School, where Xzayvier was in his classroom. It was about 2:30 p.m. when vehicles rolled up to the front of the school and parked. SPC Harris, wearing his Army camouflage, hopped out of one of the Humvees and entered the school. 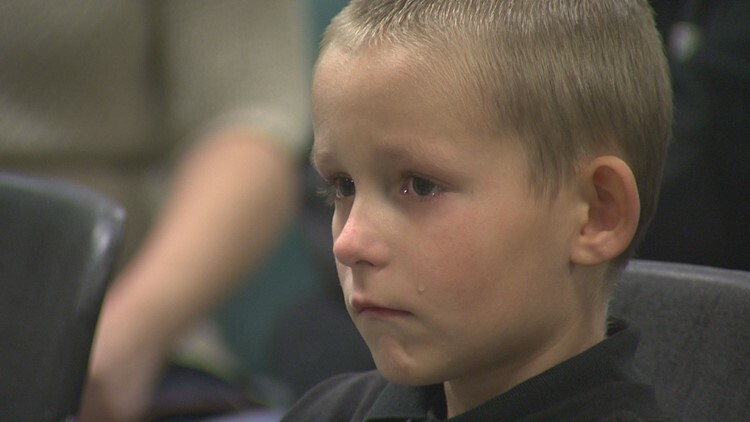 He was quickly escorted upstairs to Xzayvier’s classroom, where he slowly opened the door. The look on Xzayvier’s face was priceless. Xzayvier said, “yes,” packed up his school supplies, grabbed his little walker, and left the classroom with SPC Harris. Xzayvier saw several of his fellow students lined up along a sidewalk chanting, &ldquo;Xzayvier; Xzayvier; Xzayvier.&rdquo; SPC Harris and Xzayvier walked amongst the students and when they reached the end, the Army convoy awaited them. Xzayvier said he was ready, despite still being completely unaware of what was about to happen. The door opened, and Xzayvier was greeted by hundreds of his fellow students lined up on both side of the sidewalk, as far as his little eyes could see, leading all the way to 7th Street. The students cheered as SPC Harris ushered Xzayvier down the sidewalk. Once the pair reached the end, Xzayvier saw the first part of his surprise. A real Army convoy was waiting for him. SPC Harris helped Xzayvier into one of the Army vehicles, then the convoy began to move. The parade of vehicles drove along some back roads before reaching Alpine Avenue. Once traveling along Alpine Avenue, Xzayvier got to experience what it was like to get Presidential treatment, which involved having the right-of-passage through red lights and causing other vehicles on the road to pull off to the side and stop as a sign of respect. 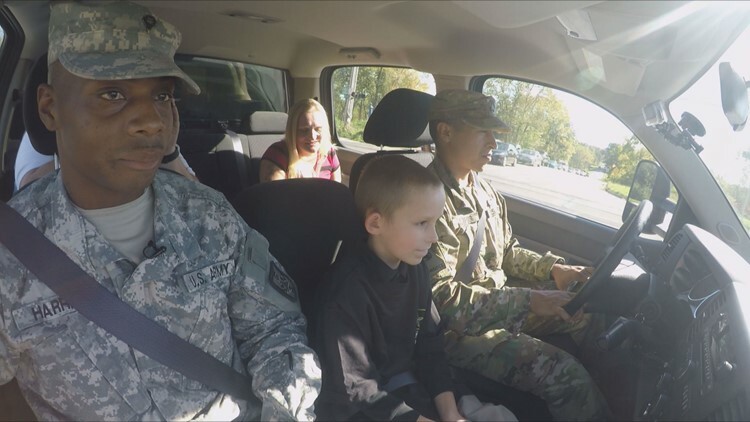 During the trip, Xzayvier got to experience what it was like to receive military treatment, which included having the right-of-way to go through red lights, and watching other cars along the route to pull over and stop out of respect. “Even I have never had treatment like this,” SPC Harris said to Xzayvier, as the convoy made its final turn off 3 Mile Road into the parking lot of the Army Reserve Center. This is where the second, and most important, part of SPC Harris’s surprise was about to unfold. 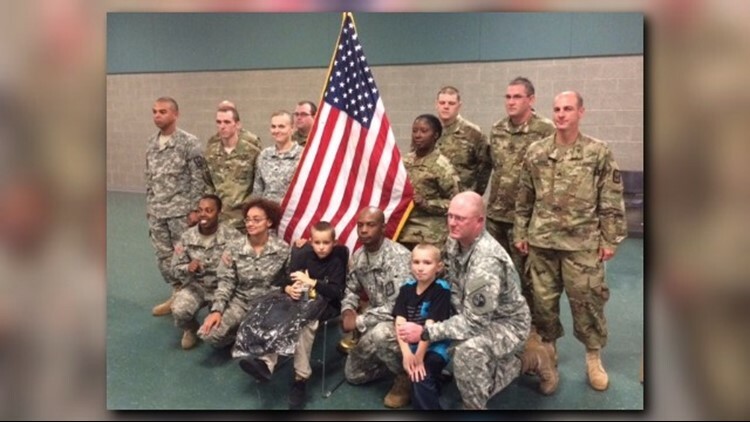 “We’re going to make Xzayvier an honorary soldier,” said SPC Harris. Xzayvier exited the Army vehicle, grabbed his walker, and slowly made his way, along with several of his family members and friends, inside the Reserve Center, where several more Army and law enforcement personnel were awaiting him. Xzayvier and his parents were ushered to front-row seats, and then a presentation began, led by LTC (R) Melvin Bauman. LTC Bauman moved from behind the podium and made his way toward Xzayvier. “Raise your right hand and repeat after me,” said LTC Bauman, as he began to ask Xzayvier to recite the Oath of Enlistment. LTC (R) Melvin Bauman, who served 40 years in the United States Army, was on hand at the Reserve Center to swear-in Xzayvier. Bauman had Xzayvier raise his right hand and repeat the Army’s Oath of Enlistment. After Xzayvier was sworn-in as an Honorary Soldier, he received a special certificate to commemorate his induction. These are scans of the program that was handed out to those who were invited to attend Xzayvier’s induction ceremony at the Army Reserve Center in Walker, Michigan. This is a scan of the official Mission Sheet which confirms Xzayvier’s honorary induction into the United States Army. This is a scan of a letter which was mailed from Helen DeVos Children’s Hospital to Christine Bushard (Xzayvier’s mother) explaining the diagnosis of Xzayvier’s leg problem. Xzayvier moved to the edge of his chair, raised his right hand, and repeated each line of the Oath LTC Bauman delivered. “On this 14th day of October, you are now an honorary soldier,” LTC Bauman told Xzayvier. The room full of people erupted in applause. LTC Bauman handed Xzayvier a certificate confirming him as an honorary soldier in the United States Army. “I want to thank all of you for doing this for my son, letting him know that anything is possible, letting him shine today, and letting him know to never give up,” said Christine, as she emotionally addressed the crowd from the podium. Right after Xzayvier was sworn-in as an Honorary Soldier, the 7-year old felt the weight of the moment, and realized his dream had come true. A lone tear falls down his cheek. Xzayvier was looking directly at his mother, and with a tear slowly rolling down his cheek, he nodded in agreement. For this Army Reservist, pulling off this event and making Xzayvier’s dream come true is "mission accomplished." “I’m just thankful and honored that the family opened up to me that day, telling me what was going on and actually allowed me to put this event together for them, said SPC Harris. Xzayvier Buchard-Mease poses with SPC Larry Harris and several other members of the United States Army Reserves, upon conclusion of his honorary induction ceremony. Medicaid has covered all of Xzayvier’s medical expenses since his diagnosis in 2013. The Grand Rapids chapter of the American Legion, a United States Veterans Association, has stepped in and helped Xzayvier’s family make contact with Shriners Children’s Hospital in Chicago, Illinois. Xzayvier will be traveling to Shriners on Nov. 18 for a second opinion on his leg. All expenses for this evaluation will be paid for by Shriners. Unless further testing is needed, Xzayvier and his family will find out on the 18th whether or not amputation will be necessary. “Our Michigan Life” airs weeknights at 6 on WZZM 13 News.